First, the movie. 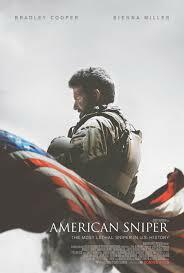 I won’t go into great detail, other than to say that it is based on the true story of Navy SEAL sniper Chris Kyle (Bradley Cooper) — hailed as the deadliest shooter in American military history — his experiences in the Iraq War, and his struggle with post-traumatic stress disorder upon his return home. At the beginning of the film, me meet a young Chris Kyle (Cole Konis), who fights a group of bullies in defense of his younger brother. Chris’ father, Wayne (Ben Reed), tells his young sons that there are three kinds of people in the world. Most people, he says, are sheep — that is, people who “prefer to think that evil doesn’t exist in the world.” And then there are the wolves, who prey on the weak and thrive on violence. Finally, there are the sheepdogs, the strong who defend the vulnerable against the wolves. Wayne, a Christian father raising a Christian family, intends for his sons to be the latter. His goal in this instance is to make sure that Chris was acting as a sheepdog rather than as a wolf. The relevant intuition [used in support of pacifism] seems to be that (…) helping is good and harming bad. (…) [T]hat intuition can lead to no action unless it is limited in some way or other. You cannot do simply good to simply Man; you must do this or that good to this or that man. (…) [W]hen B is up to mischief against A, you must either do nothing (which disobeys intuition) or you must help one against the other. Between these two citations — the scene from “American Sniper” and the snippet from “Why I am not a Pacifist” — we can gain a pretty decent understanding of how a Christian can choose to go to war, or use force in any instance. It is not my intention to get into a discussion of whether the Iraq War meets Just War criteria, nor whether sniping, as a practice, constitutes a form of just warfare. But a lot of people tend to make this automatic, knee-jerk assumption that to fight in a war or use any kind of force is ipso facto incompatible with being a faithful Christian. But, as Lewis and the elder Kyle suggest, part of one’s Christian duty is to defend the weak. And sometimes, this requires force — on individual, communal, and sometimes even national and international levels. To be sure, such force should always be as minimal as possible, restraint must be preferred to killing, and the death of a “wolf” should be avoided whenever reasonably possible. But if we want to issue a wholesale condemnation of all warfare, it should give us pause that the weight of reason, history, and even Christian tradition itself is against us. Needless to say, I am only scratching the surface of Lewis’ essay. But since my main intention is a treatment of Eastwood’s film, I think I’ll just encourage you to read it yourself and leave it at that. As for the movie, more to come. If you were to define pacifism as being against the use of violence of any kind than I am not a pacifist. If you define pacifism as being against the termination of life. Whether that be abortion, capital punishment, or war, than yes I am a pacifist. That said your post is well thought and well put.